“I know what FFA means to people. 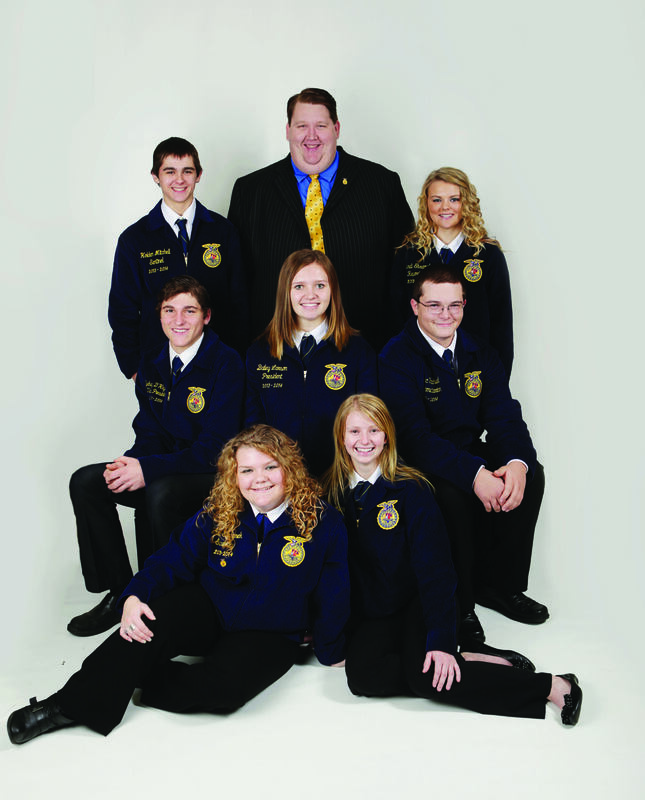 This is the story of how one man led a FFA chapter through a rough patch. The story begins as Boe was leaving a job as a legislative aide at the State Capitol to return to his hometown and become WFBF’s District 4 Coordinator in July of 2011. As a state FFA officer, Boe was first encouraged to pursue his passion for public policy by then-State Representative Bobby Gronemus. Their friendship and FFA opened doors for this Jackson County farm boy, including an internship in Washington D.C. with Congressman Ron Kind in 2007. “I know that FFA is more than being on the farm. The leadership skills you receive are a huge component,” Boe said. Boe had heard rumblings that a neighboring school district was cutting its agriculture program. It got his attention when a parent from that school district asked him if he would become an advisor to this FFA program without ag classes. “Once I felt confident this was something I could do, I had to convince my new boss,” Boe said. A series of successes marked the 32 months that Boe led a west-central Wisconsin FFA chapter. By November 2011 it was official. “The atmosphere was challenging,” Boe admits, and not just because he started mid-way through a semester. One of FFA’s bylaws states that only students who have had an agricultural course could be considered a state and national member. With no agriculture courses available, the pool of new members would have to be ‘local’ members, unable to attend most district, sectional and state FFA activities. Not being at the school on a daily basis proved challenging. “At first I was leery about giving my cell number to FFA officers, but text messaging became the best way to communicate,” Boe said. “I thought they’d want it at study hall and I’m still mad at myself for not checking, but now most are held during lunch,” he said. “This is a community that should have an ag program,” said Boe, who convinced the school district to offer a quarter-credit agriculture class during the first period study hall. It was taught by Gaylord Oppegard, a retired ag teacher and Jackson County Farm Bureau member. It helped attract about 20 new members in the small high school (fewer than 200 pupils). By January 2014, a new ag teacher, Matt Esser, was hired for a half-time position. Enrollments for the coming school year have put him at full-time. Boe handed over the reins of the FFA chapter to Esser in July. “He worked relentlessly and we have him to thank for the newly instated ag classes at our school,” said Michaela Bemis, a Lincoln graduate. “Steve’s service to the Alma Center-Lincoln FFA Chapter is a great example of identifying a way that Farm Bureau can make a difference in a community,” Leege said. In addition to his job as district coordinator for six west-central Wisconsin county Farm Bureaus, Boe farms with his parents, Daryl and Kathy, who raise 160 steers and 400 acres of crops. Aside from the current roster of Lincoln FFA members Boe advised, he saw great potential in Trenton Bemis (pictured below), a Lincoln graduate and third-generation cranberry bog manager who was a national fruit production proficiency award winner in 2011. “As I got to know him, I thought he should apply for the American FFA Degree and prestigious Star in Agricultural Placement Award. It meant many nights of proofreading his application. “We were pleased as punch just to be Wisconsin’s nominee for the award,” Boe said. The stage was set as the local FFA Alumni paid for new school district superintendent and Trenton’s family to attend the National FFA Convention in Louisville, Kentucky. 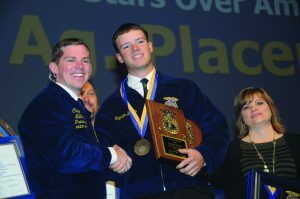 The kid from the once nearly-defunct FFA chapter was named a national FFA star. “It was a little strange, because I know many great advisors who go an entire career without having a student reach that kind of success,” he added. • 2002 graduate and FFA President at Blair-Taylor High School. • State FFA Sentinel 2003-04. • 2008 graduate of UW-River Falls with majors in agricultural education and political science. • Ran Mark Radcliff’s State Assembly campaign in 2008. Worked as his legislative assistant at the Wisconsin State Capitol from 2009-2011. Story by Casey Langan. Original version appeared in the August/September 2014 issue of Wisconsin Farm Bureau Federation’s Rural Route.